Moving the information into PowerSchool is a three step process. First, creating sections in Summer PowerSchool. Second, importing students from summer school registration to Summer PowerSchool and lastly importing class enrollments. Importing Class enrollments must be done last in order for it to import properly. In Summer PowerSchool follow the PDF on how to create a section. It is crucial that the start date, end date, and school match what is in the summer school registrations. If they do not match exactly, the student enrollments will not import properly. Importing students has been simplified. 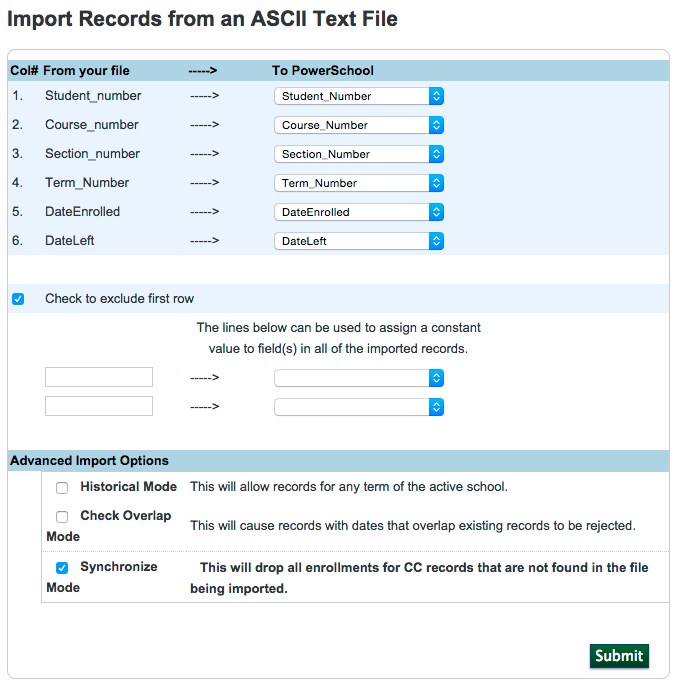 There is no longer a need to export and import in Summer PowerSchool. Summer School registration will automatically enroll/update students. To begin the process log into sr.glenbard.org with an admin account. Under the top menu Reports, click Student Import for PowerSchool. This page consists of a single button and a link. All that needs to be done is click the Transfer to Summer PowerSchool. The system will then add or update any students that have class enrollments in summer school registration. This process should only be done by one person. Importing students can be done as often as necessary. Import class enrollments are a two-step process. A file is downloaded from sr.glenbard.org and then imported into Summer PowerSchool. Log into sr.glenbard.org with an admin account. Under the top menu Reports, click Enrollment Import for PowerSchool. A file will automatically download. Do NOT open the file in Excel. Opening the file in excel can introduce errors when importing. The second step is to import the file into Summer PowerSchool. When importing this error message will appear not importe because of Duplicate record detected that is fine. Also all manual schedule changes will remain in place if/when then enrollments are imported again.